Oh boy! You know I love science fiction, readers. I’m a fan of Star Trek and Isaac Isamov, and even Andy Weir (who wrote The Martian) and, in an attempt to expand my science fiction literary horizons, I’ve been trying to get into some writers (old and new) to try and figure out what’s out there. I had always wondered if maybe short stories are not the best way to write Science Fiction, but since Asimov has pulled off that format so well, it makes me wonder if he is actually an anomaly. 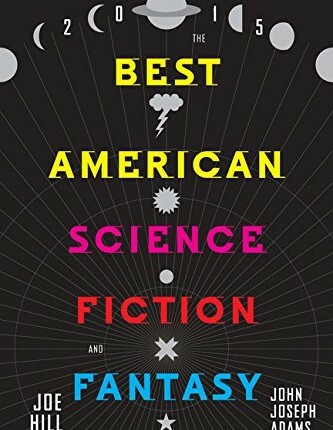 The Best American Science Fiction and Fantasy definitely takes a good (and interesting) stab at the art form, but again, I felt like I was left hanging for most of these stories. The good ones set the scene quickly and develop in interesting directions, but there simply is no chance to really get into the core of the stories and explore the ideas better. Highlights for me were definitely Neil Gaiman and “How the Marquis Got His Coat Back” about â€“ you guessed it â€“ some witty nobleman who is trying to get his awesome coat back, Daniel H Wilson’s “The Blue Afternoon That Lasted Forever” about a family preparing for the end of the world, and Adam-Troy Castro’s hilarious “The Thing About Shapes to Come” about a weird plague that makes it so that human can only give birth to shapes (cubes, balls, rhombuses, etc).